Oceanic Edibles International Limited (OESIL) is that part of the Oceanaa group of companies, a leading suppliers of sustainable seafood and a range of seafood products to countries around the world. For over a decade, the company has offered unparalleled standards of quality and reliability of supply from farm to plate. Today, millions of customers and several partners benefit from OESIL's access to a vertically integrated network focused on maintaining customer service, innovative technology, and streamlined operations, making it the preferred name in seafood expertise. an absolute commitment to mutual growth and ongoing reinvestment in the industry. The Bay of Bengal has always been known for the high quality of its seafood. Cold salt water, scouring tides, and an influx of nutrients from the oceans around provide the critical habitat required for native species of marine life to flourish. The OESIL's Hatcheries are located at Alapakkam, Mandavai village near Pondicherry, with Nauplii centers at Andaman, Vishakhapatnam, and Kanyakumari. 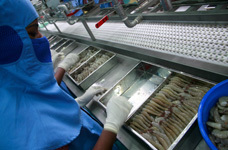 The Seafood Processing Plant is located at Marakkanam. OESIL's Seafood Plant at Marakkanam is a modern, international, and vertically-integrated operation, catering to the premium quality seafood segment. It owns farming over 140 hectares, and engages in contract farming over another 750 hectares. Apart from the Oceanic Research Achievements Institute (ORAI), which has its own labs for Microbiology, Molecular Biology, and Analytical Chemistry, there are Seafood Processing Units for IQF (10 tonnes/day), 3 Plate freezers (15 tonnes/day), One Blast freezer (15 tonnes/day), & One Breading and battering line(6 tonnes/day). The OESIL's Hatchery consists of Units I, II, and III, with a production capacity of 700 million seeds per annum. There are modern, independent, isolated Maturation, Individual Spawning and Hatching sections supervised by trained technicians. The support units consist of Nauplii centers at Port Blair with a capacity of 2000 million Nauplii per annum and at Vishakhapatnam and Kanyakumari with a capacity of 5000 million Nauplii per annum. WSSV and MBV screening is done for all brooders upon arrival at Quarantine, as well as for mature animals spawned in individual tanks. There is further screening at Post Larvae 5. Proper washing of eggs and nauplii with clean seawater, iodine and formalin. Intake water is passed through slow and rapid sand filters, chlorination process, activated carbon filter, cartridge filters upto 1 micron, and UV filtration. Bio-security is maintained at every level of production, with all facilities isolated and independent to avoid cross-contamination. Microbiology for Bacterial count and MBV analysis through Microscopic observation. Water Analysis for Measurement of physical and chemical parameters. The products are also double-checked at the Institute of Medical Veterinary Science for the quality of ice, water and the sterility of the catch processed. Pioneers in contract farming, OESIL offers complete backward and forward integration starting from the sourcing of the mother prawn. Professionally coded standards exist at OESIL for sustainable sourcing based on independent third-party assessments by accredited certifiers to meet the world's best practice criteria. Care and attention is paramount at all stages. At all the company's own farms and contract farms, water quality is enhanced by the introduction of probiotics - organically cultured bacteria - to ensure high survival rates for prawns. The raw material required for the processing units is completely taken care of by our company Oceanic Bio-Harvest Limited (OBHL) through its own farm and contract farming with full traceability maintained from mother prawn till processing. We have Contract Farming agreements with select farmers spread over 750 hectares across Tamil Nadu and Andhra Pradesh. This not only secures their incomes but ensures capacity building and quality for international buyers right from the time the mother prawn is brought into the hatchery. Documentation is strictly maintained starting from sourcing the catch to the final audit. We also facilitate specific agreements between these farmers and recognized banks for credit facilities; and also supply the farmers with seed, feed, and aqua health products, besides ensuring a buyback guarantee. OESIL has a processing capacity of 45 tonnes of marine products per day, with a double infringement IQF Tunnel, Plate Freezer, and Blast Freezers. The process flow has been designed to match the highest industry standards. Since the bulk of the raw material such as shrimps and fish are sourced from in-house farms, the process is integrated right from the hatchery stage, through to production.